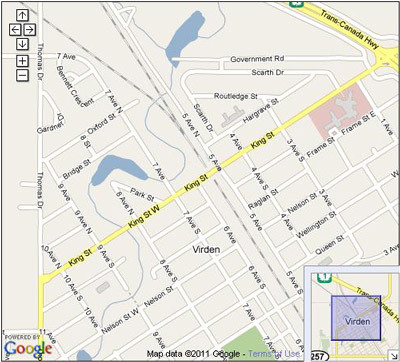 The town of Virden is located in the southwest region of Manitoba along the Trans-Canada Highway west of Brandon. The town was known originally as “Gopher Creek” when it was first settled by pioneers looking to carve out the new life as farmers in the west. When the Canadian Pacific Railway finally reached the area in the 1880’s the town was renamed Virden. Due to the ideal flat landscape, the railway segment stretching from Oak Lake to Regina actually held the record for the largest span of tracks in the world to be completed within one season. The railway is also the reason for what visitors and residents may notice the southwest angle of the town streets and buildings. In order to get the best bridge of footing for the tracks, they were laid form he southeast to northwest. Virden has stately old homes that have been preserved from the turn of the century. In 1951 the town went through an uproarious change when oil was discovered in the region. At that time the population grew, business sprang up, housing and construction flourished and pipelines were laid between communities. The oil boom of Virden has recently been made in a documentary film entitled Eternal Flame. The Virden Airport was originally built during World War II as a Commonwealth Air Training Base. It now has a 4,000 foot runway paved and lighted that can accommodate most character and commercial flights as well as the Life Flight program based out of Winnipeg. The Central Hotel has always been a vital part of the Virden & Area community and as such gives back when opportunity strikes. The Central Hotel is very proud to be part of the New Recreation and Multi-Purpose Facility currently being built in Virden. In November of 2009 the Central Hotel donated $25,000 towards a section of seats in the new facility. 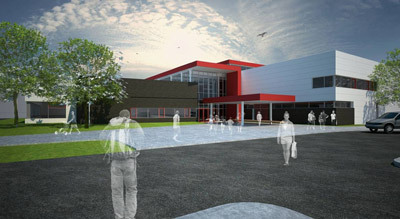 Please visit www.virden.ca for more information on the recreation facility. the new Virden Rec Facility! While in Virden visit our many tourist attractions. Don’t forget to visit our historic downtown area and friendly merchants. Featuring Business District, Swimming Pool/waterslide, Golf Course, Playgrounds, Tourist Booth, Camping Facilities, Hotels and Motels.